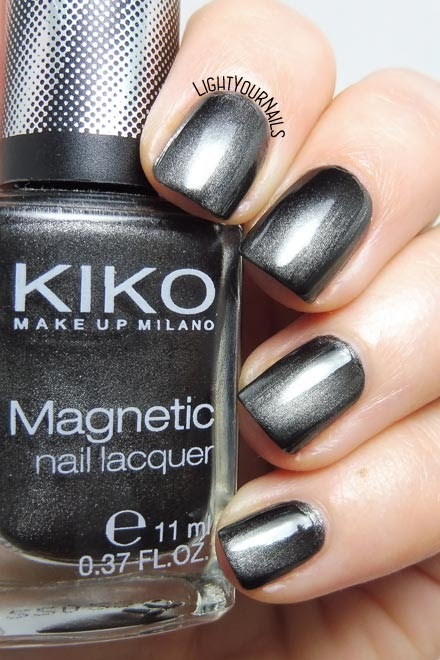 Kiko Magnetic 707 Antracite | Light Your Nails! For letter K in the Untried A-Z challenge I picked a very old nail polish. It's Kiko 707 from their Magnetic collection which is long discontinued. In the last year there was a come back of magnetic nail polishes thanks to the new magnets that give more interesting effects to the nails. I must say thanks to those new magnets I used some of my untried magnetics, too. Kiko 707 is a gunmetal grey if used as a standard nail polish. When you use a magnet the particles kinda pile together and some parts of the nails are left completely black. It's such an interesting shade! Application is a dream, I didn't even need to clean around my cuticles. Drying time is very fast and the finish is unbelievably glossy. Photos are two coats without a top coat. First pics are with a cat eye magnet, last one is a classic for diagonal stripes. Both of them are from tosave.com. You can find a review of that 11-magnets-pieces set >HERE< on the blog. Cosa ne dite? A me è piaciuto tantissimo l'effetto in entrambe le versioni! Avete anche voi degli smalti magnetici nella vostra collezione? I can never get enough of magnetics and this is such a pretty one! It's fun I've never really liked them when they were first released and now I'm such a big fan! Also, sorry for the belated answer, I just found out Blogger is no longer not notifying me new comments.